R.B. 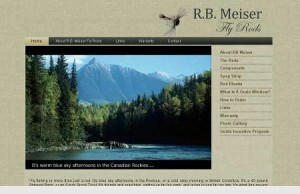 Meiser Fly Rods – It’s SEO And Not Magic, Bob! Area Serviced: Ships world wide. Product: Fly rods, especially spey, double handed and switch rods. Working with Bob Meiser has been a joy for me. I remember the first time we spoke on the phone, and we talked about fishing, Irish whiskey, and his web development needs. Bob has a product which, generally speaking, competes against some of the largest fishing rod manufacturers in the world. But Bob’s rods are of a very high quality and unique design which offers fly anglers some extra choices when it comes to spey fly fishing and double handed casting rods. He wanted a website that looked as good as anyone else’s out there and at the same time, it was vital for him to have excellent search engine rankings on a number of search words and phrases. I am ranked very highly on major search engines and for many search word phrases, I have the most valuable #1 spot! Website was optimized for search engines and included analyzing key word frequency rates. Adjustments and tweaking made where and when necessary. Backlinks were sought from relevant external websites. Other Search Engine Optimization practices were implemented. Bob Meiser presently owns the #1 spot for a variety of search terms and phrases that are relevant to his products, and searchers click through to his site. How valuable do you think that is to him? It wasn’t magic. In fact, it was hard work – but we enjoy doing it, and I enjoy receiving and hearing the compliments on the work that’s been done.